United National Party Puttalam District defeated candidate Shantha Abeysekara and four others were arrested by Police in connection with the brutal assault on former UNP Parliamentarian Palitha Range Bandara and his supporters Saturday. Police spokesman SP Prishantha Jayakody told the Daily News that Bandara was admitted to the Colombo National Hospital (CNH). 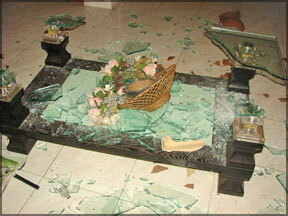 Bandara was assaulted at a UNP supporters’ meeting presided by him held at a house on Sinhapura Road, Chilaw. He was admitted to Marawila Hospital and thereafter transferred to the CNH. SP Jayakody said Shantha Abeysekara had lost at the election while Bandara was elected and according to inquiries the brawl was over the preference vote issue. The suspects were produced before Chilaw Magistrate yesterday. Abeysekara obtained the third highest number of preferential votes from the UNP in the Puttalam District at the April 8 General Election while Bandara and Niroshan Perera were placed first and second. Only these two were elected to Parliament from the UNP from the Puttalam district. Witnesses told the Daily News that a mob prevented Bandara’s supporters from admitting him to the Chilaw Hospital. Hence he had to be taken to Marawila Hospital, the ex-Parliamentarian’s bodyguard police constable Ratnayake and another supporter P.M. Suriya Bandara of Arachchikattuwa too suffered injuries in the attack and were admitted to the Chilaw Hospital. The meeting had been organized to thank voters who supported Bandara. When the meeting was in progress the thugs numbering about 15 rushed in vehicles with swords and poles and began assaulting the participants. Most participants fled the scene while Bandara and two others confronted the mob. Chilaw Police are investigating.